NeoShip, Neopost’s powerful online shipping solution, ensures full IMpb compliance for all your USPS® shipping requirements. 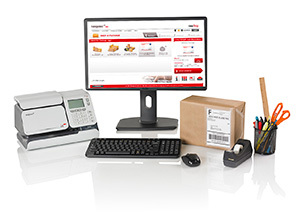 Shipping directly from your desktop has never been easier. NeoShip is available as an option for our IS and IN-series mailing systems. Simply access NeoShip through your MyNeopost online account, follow the illustrated prompts and create your shipping label. How can NeoShip Help you?